Vintage swimwear. These ladies must work out to be brave enough to sport these racy swimsuits. Something about the polka dots. Even her shoes have them. Eat right. Work out. Keep fit. Do you know where you can get great swimsuits year round? On Amazon. 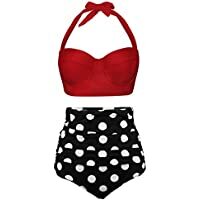 And they have some fabulous polka dot swimsuits with a retro vibe. The vintage polka dot look is classy and timeless. Previous Previous post: Pie Today. Gym Tomorrow.